Tupamahu, Ekaputra 2018. Language Politics and the Constitution of Racialized Subjects in the Corinthian Church. Journal for the Study of the New Testament, Vol. 41, Issue. 2, p. 223. Junior, Nyasha 2014. Womanist and Black Feminist Responses to Tyler Perry’s Productions. p. 27. The apostle Paul has been justifiably described as the first and greatest Christian theologian. His letters were among the earliest documents to be included in the New Testament and, as such, they shaped Christian thinking from the beginning. As a missionary, theologian and pastor Paul's own wrestling with theological and ethical questions of his day is paradigmatic for Christian theology, not least for Christianity's own identity and continuing relationship with Judaism. 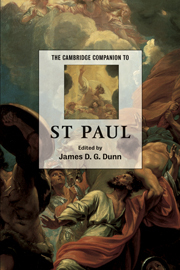 The Cambridge Companion to St Paul provides an important assessment of this apostle and a fresh appreciation of his continuing significance today. With eighteen chapters written by a team of leading international specialists on Paul, the Companion provides a sympathetic and critical overview of the apostle, covering his life and work, his letters and his theology. The volume will provide an invaluable starting point and helpful cross check for subsequent studies.